PERFORMANCE AND INNOVATION. DELIVERING REAL RESULTS. Farmers who plant Asgrow® and DEKALB® have many reasons to be confident in their seed choice. These products are developed from a global germplasm pool, with advanced breeding techniques, and combined with innovative Genuity® traits to help deliver superior performance and greater productivity on the farm. DEKALB® is a national seed brand providing corn to farmers in all regions. The winged corn ear is a logo farmers have grown to trust. For 100 years, DEKALB® has represented outstanding yield performance and industry-leading innovation — and this continues year after year. Farmers rely on Asgrow® soybeans to help deliver a consistent, high performance year after year. With Asgrow® soybeans, you can be confident you are getting high-performing seed with excellent yield potential driven by advanced breeding techniques and elite genetics. Get Started with Asgrow® and DEKALB® today. No need to search through hundreds of pages to find the right seed for your fields. 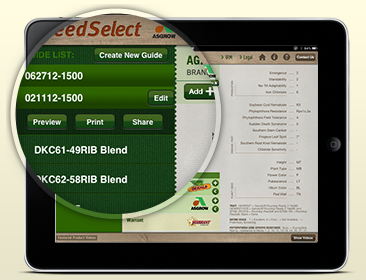 agSeedSelect™ lets you create your own custom seed guide with recommendations based on your specific zip code and crops. Save guides and reduce hassle. 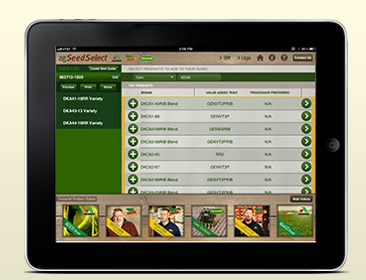 Store your customized seed guide on your tablet for quick and easy reference when out in the field. Email it and print hard copies as needed. 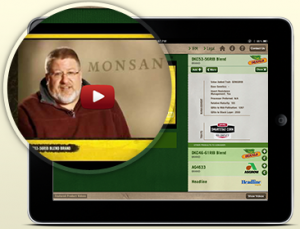 Learn from experts – agSeedSelect™ features videos offering detailed information on the use of our products. Not even our most comprehensive printed seed guide can do that.